Eric Soto demonstrating the Haimer Shrink Machine. The HOUSTEX Student Summit, hosted by SME and its local Chapter 29 for Houston-area high schools, was held on the event’s final day, Feb. 26, to highlight manufacturing career opportunities and showcase the amazing potential presented by high-tech advances. 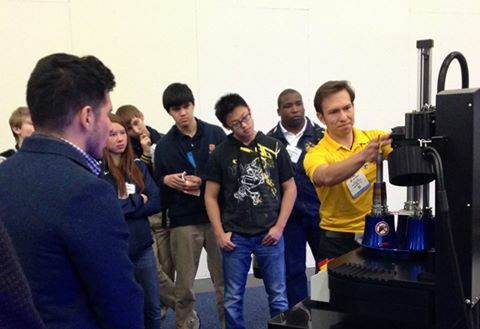 Students are given access to innovations in manufacturing technology and the opportunity to engage with industry experts. For instance, students at this year’s event designed a wind turbine, constructed it with a 3D printer and tested its performance. As an SME member, the Tom Paine Group stepped forward as a student-friendly exhibitor to impress students with recent developments in metalworking technologies. “We represent some of the best, most innovative companies in industrial technologies,” said Tom Paine, president of the manufacturers’ rep group. “These are often the teams driving transformational changes in manufacturing today. It was the perfect opportunity for them to see the unbelievable, exciting new ideas that are changing the world. That’s what industrial technologies do. Student Summit attendees are exactly the right audience to engage, Paine said, praising the efforts of the SME Education Foundation. He and the manufacturers he represents are acutely aware of the predicted shortfall in skilled talent of nearly 900,000 within the next 10 years. That includes the next generation of manufacturers’ reps, who will require deep knowledge in all technologies used to gain a competitive edge. This entry was posted in Press Release, Productivity Pages, What's New. Bookmark the permalink.